What features does the Instant Tent offer? The Coleman Instant Tent is available in 4 sizes and is designed for family campers who want a cabin tent that sets up quickly with a minimum of fuss. With the Instant Tent's integrated pole frame and tent-body fabric, campers need only to unfold the pole sections and then to telescope and lock them into position to put up the tent. With a bit of practice, the tent can be standing within 10 minutes, even working at a leisurely pace. No need to tediously lay out pole sections, match them, attach them together, slide poles through the proper tent body sleeves, attach the tent floor pins, etc. to put up the tent. Large doorways offer easy access for loading gear into the tent. Large windows ventilate well. Large zipper cuffs over all zipper tracks protect them from leaking in the rain. The heavy-duty, 150-denier fabric on the tent body resists rain and wind. This fabric is approximately 50% thicker and substantially heavier and more durable than the standard 68 to 75-denier polyester fabric in most tent fabric. The Coleman Instant Tent is fully taped at the factory, so campers need only to perform a minimum of spot sealing to prepare the tent for camping. A 1000 denier polyethylene bathtub floor resists standing water around the tent. An optional half rainfly is available for each size of the Instant Tent. It will make the tent more comfortable in the rain. The ease of setup makes the Instant Tent a good tent to convince a reluctant partner or family to give camping a try. 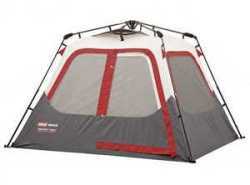 This tent is relatively inexpensive for the size and convenience it offers for family camping. How is the Instant Tent designed? To speed set up, Coleman has designed the tent with an exposed external frame. The pole sections are permanently connected by hinged joints and a hub, instead of held together by shock cord. The tent fabric hangs from the pole frame and stays attached, even when the tent is taken down and stored. To put up the tent, campers unfold the frame and telescope the poles. The tent fabric is tensioned as the frame expands. To take down the tent, the frame collapses and folds together, and the fabric and frame form a tent bundle, which rolls up and tucks into a carry bag. The Instant Tent comes without a rainfly, so the ceiling of this single-wall tent is solid fabric, except for a hooded vent at the peak. Without large mesh ceiling panels, most ventilation is managed through the windows, which rise high on the walls of the tent body. Why is the rainfly optional? The Instant Tent is one of the few family camping tents offered as a single wall tent with an optional rainfly. Due to the solid fabric ceiling, the tent does not need a rainfly in light to moderate rains. However, without the optional rainfly to extend the drip line, rainwater will run off of the roof, down the walls and into an open window of the tent. For family campers who like to camp in more than brief, light rain, and want more comfort inside the tent, Coleman offers a separate, half rainfly as an accessory for each size of the Instant Tent. The rainfly covers the top of the tent and will shed rain away from the window tops, allowing them to remain partially open for ventilation. This will make it easier to distinguish between them. The smaller Instant Tent sizes are fairly square. A 2 zipper, roll-back door leads into the tent body. One zipper track runs along the top and side. The other runs along the bottom. The zippers meet at the outside lower corner of the door. Due to the smaller ceiling spans of these Instant Tent sizes, the wall poles telescope, but the ceiling poles do not. The floor dimensions of the Instant Tent 4 are 8' wide by 7' deep by 59" (4'11") high (2.4m x 2.1m x 1.5m). The 56 square feet of floorspace is rated to sleep up to 4. The Coleman Instant Tent 4 should comfortably sleep 1 adult or 2 young campers. The tent will comfortably hold a twin air mattress for a solo camper and leave room for gear, dressing and moving about. A queen air mattress will fit, but would turn the tent into a sleeper tent. A larger Instant Tent is recommended for this mattress. A camping couple can better manage inside the tent with self-inflating sleeping pads, which offer both sleeping and sitting space. The 59" of ceiling height offers stooping height. Campers will not be able to stand upright inside, but will be able to dress and move about on their feet. The Instant Tent 4 would make a good second tent for a couple of family members who would like a separate sleeping space. The tent has 4 windows: 2 in the front (1 in the roll-back door and the other in the wall next to it) and 1 in each upper side wall of the tent. The back wall of the tent has no window. 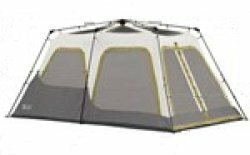 A large, single vent at the peak, facing the front of the tent, helps exhaust humidity from the tent body. The Coleman Instant Tent 4 weighs 35 lb, fits into a 3' long carry bag and will fit on a small, 8' by 8' tent pad. The Instant Tent 4 Optional Rainfly will keep the tent comfortable in more than light or brief rain. Instant Tent 4 Parts are available from Coleman. The floor dimensions of the Instant Tent 6 are 10' wide by 9' deep by 71" (5'11") high (3m x 2.75m x 1.8m). The 90 square feet of floorspace is rated to sleep up to 6. The Coleman Instant Tent 6 should comfortably sleep 1 to 2 adults. The Instant 6 will comfortably hold a queen air mattress and leave room for gear, dressing and some moving about. The 71" of ceiling height offers standing height. Most campers will be able to stand upright in the center of the tent. The Instant 6 has 5 windows: 2 in the front (1 in the door and the other in the wall next to it), 1 in each upper side wall, and 1 opposite the door in the upper back wall of the tent. 2 hooded vents at the ceiling peak, facing the front and back, draw humid air out of the tent. The Coleman Instant Tent 6 weighs 38 lb, fits into a 4' long carry bag and will fit on a medium-size, 10' by 10' tentpad. The Instant Tent 6 Optional Rainfly will keep the tent comfortable in more than light and brief rain showers. Instant Tent 6 Parts are available from Coleman. Due to the lack of mesh ceiling panels, it is wise for campers to get a larger Instant Tent for their number than they would, if considering a different style of cabin tent. This will reduce condensation and ensure more comfort inside the tent. The Instant Tent is free standing. By removing the stakes, the tent can easily be moved or turned, in order to enjoy a better view or to catch a breeze. The hood of each peak vent is accessible from inside the tent via a zipper in the small screens directly below it. A plastic clip holds the hood open and a velcro closure seals it. The Instant Tent is handy for families who only camp a few times a year, because it sets up quickly and is not overly expensive. The "Instant" moniker on the tent means that it sets up quickly. However, it does not necessarily mean that the tent is ready to camp in out of the box. As with most tents, the Instant Tent should first be rain tested and spot sealed. Due to the more complex pole frame, campers should use the tent within a few weeks of ordering it. Should the tent fail, campers can then work directly with the retailer to immediately replace the tent or refund the purchase price. A retailer generally offers quicker service than the manufacturer. The optional rainfly for the Coleman Instant Tents can also be found on Ebay. The larger Instant Tent sizes are rectangular. Poles at each corner and in the center of the long walls support the tent. An inverted 'T' door with 3 zippers spans one of the shorter walls. One zipper runs down the center vertically and 2 run along the bottom of the doorway, one on each side. The 3 zippers meet at the lower center of the door. The larger Instant Tents divide into 2 rooms: a back bedroom and a front combo room, which can be a screen room or a sleeping space. A divider curtain separates the two rooms and zips down the middle, rolls up and ties off at the ceiling. The side walls and front door of the screen room have tall screen panels that offer a view of the surrounding outdoors. The screens in the front room have storm flaps, which roll up, zip along the sides and fasten with loops and toggles across the top. The storm flaps on the screens in the back bedroom zip completely closed across the sides and top. Due to the longer ceiling spans of these Instant Tent sizes, the corner ceiling poles, as well as the wall poles, telescope. The inverted 'T' door of the tent leads to the front combo room. With a bathtub floor and sealable window flaps, the screen room can be made into a sleeping space. The 112 square feet of floorspace is rated to sleep up to 8. The Instant Tent 8 should comfortably sleep a family of 4. This size would be a spacious tent for 2 campers, offering a back bedroom for a queen air mattress and a front room for sitting out of the sun away from flying insects and from rain. The 76" of ceiling height offers standing space for most tall campers. If no rain is expected, a queen and a twin inflatable mattress might fit side by side in the back bedroom. However, they will be up against the tent walls. The Instant 8 is a long, rectangular tent with the door at one end, which suits the tent to families with young children. Small children can be placed in the back bedroom to sleep or move about and will not be able to open a zipper to exit without passing through the front of the tent, which adults can easily monitor. The Instant 8 has 7 windows: 2 in the front inverted 'T' door, 1 in each side wall of the front room, 1 in each upper side wall of the back bedroom, and 1 in the upper rear wall of the bedroom. 2 peak vents in the ceiling draw humid air out of the tent. The Coleman Instant Tent 8 weighs 35 lb., fits into a 4' long carry bag and will fit on a 15' by 15' tentpad. The Instant Tent 8 Optional Rainfly will keep the tent comfortable in more than light and brief rain showers. Instant Tent 8 Parts are available from Coleman. The Instant Tent 10 is almost identical to the Instant Tent 8, but is 2' wider. The tent dimensions are 10' wide by 14' deep by 77" (6'5") high (3.0m x 4.25m x 1.95m). This is likely the largest Instant Tent available on the market. The Instant Tent 10 has a second, roll back door on the back wall of the rear bedroom, which allows each room to have separate access to the outside. Campers should note that the Instant Tent 10 does not feature any vents in the peak of the ceiling. The 140 square feet of floorspace is rated to sleep up to 10. The Instant Tent 10 should comfortably sleep 4 adults. The back bedroom should be large enough for 2 large cots for a couple of campers who want a spacious tent that's not too difficult for 2 to set up. If no rain is expected, 2 queen size inflatable mattresses should fit side by side in the back bedroom. However, they will be touching the walls. The Coleman Instant Tent 10 weighs 43 lb and will fit on a 15' x 15' tent pad. Campers can easily confuse the Instant Tent 10 (10' x 14' floor dimensions) with the Instant Tent 8 (8' x 14'). They should check the floor dimensions of the tent to be sure of which tent they are considering. The Instant Tent 10 is also available at some camping and outdoor retailers as well as in the camping department of some large department stores. The Instant Tent 10 Optional Rainfly will keep the tent comfortable in more than light or brief rain showers. Instant Tent 10 Parts are available from Coleman. Because the larger Instant Tent sizes are divided into a screen room and a bedroom, the door of the tent is on a narrow, instead of a wide wall. If more than 2 campers are using the screen room for sleeping, it may be difficult for others to pass through the screen room around the sleeping campers, to pass between the front door and the back bedroom. The inverted 'T' door on the larger 2 sizes of the Instant Tent offers a wide opening and plenty of access for loading gear into the tent. When the front door are zipped completely open across the bottom and the front of the tent is loosely staked, the bathtub floor should lie on the ground well enough to allow access for tent campers with a wheelchair. No need for handicapped campers to step or trip over a bathtub floor lip. Retailers appear to be somewhat confused between the 8' x 14' and the 10' x 14' Instant tents and the rainfly for each. Campers should not depend on the rated sleeping capacity, but should instead verify the actual dimensions of the tent floor for the tent or rainfly that they are considering. Coleman offered an Instant Tent 9 with 9' x 14' floor dimensions. The Instant 9 has green lower fabric panels on the tent body. However, this size was evidently replaced by the Instant Tents 8 & 10. The Instant Tent 9 has no rainfly. Instant Tent 9 parts may still be available from Coleman. Campers can think of the white-over-black Instant Tents above as the original Instant Tents. This line of Instant Tents became available in about 2009. Due to popularity, Coleman has also manufactured each of the Instant Tents in the same sizes, but with unique features, under the Coleman "Max" Instant Tent line or the Coleman "Signature" Instant Tent line. The Max and Signature tent models evidently use the same pole frames as the original Instant Tent sizes. These tents also have light over dark panels for the tent body. However, the shades of the panels may be a bit different. The Max and Signature models have colored zipper cuffs around the door and windows. There are other unique features to each line, which are noted below. These different Instant Tent Lines have created some confusion among shoppers, and some have purchased an Instant Tent with different features than what they were expecting. Coleman "Max" Instant tents are available at Walmart. These Instant Tents have red trim around the door and windows. Campers can think of these tents as the "Red Trim" Instant Tents to reduce confusion with other Instant Tent lines. These tents are marked Coleman "Max" Instant Tent on the tent wall. A feature unique to the Max Instant Tent line is a hooded ground vent, which allows fresh air into the lower tent body. This is a welcome addition to a tent without ceiling mesh. The hooded ground vent is one reason to consider a Max Instant Tent over an original Instant Tent. The Max Instant line is available in three sizes: 4, 6 & 8. The Max Instant Tent 4 & 6 are pretty much identical to their original Instant Tent counterparts, and the rainflies are interchangeable. The ground vent on the smaller tent sizes is in the back wall. Unlike the smaller Max Instant Tents, this tent is substantially different from its original Instant Tent counterpart. The Max Instant Tent 8 has floor dimensions of 13' wide x 9' deep, which are different from those of the original Instant Tent 8, so the other rainfly will not fit this tent. There currently is no rainfly for the Max Instant Tent 8. Campers can instead lay a tarp over the tent in heavy rains, if necessary. The Max Instant Tent 8 does not have a front screen room. It divides instead into two equal side-by-side rooms. The doorway is in the middle of a longer wall, next to the side pole. Campers enter the tent through a long wall, instead of through an end wall. The door is D-shaped with a single zipper and rolls back to the side. There is a second identical door on the opposite wall. The Max Instant Tent 8 has a hooded ground vent on each of the shorter walls. There is no Max Instant Tent counterpart to the original Instant Tent 10. For 2014 Coleman has evidently updated the Max line. These new tents no longer feature a ground vent, except for the largest tent, which features 1 vent, instead of 2. Readers can learn more about the new Red Trim Instant Tents on the Coleman Instant Cabin page. 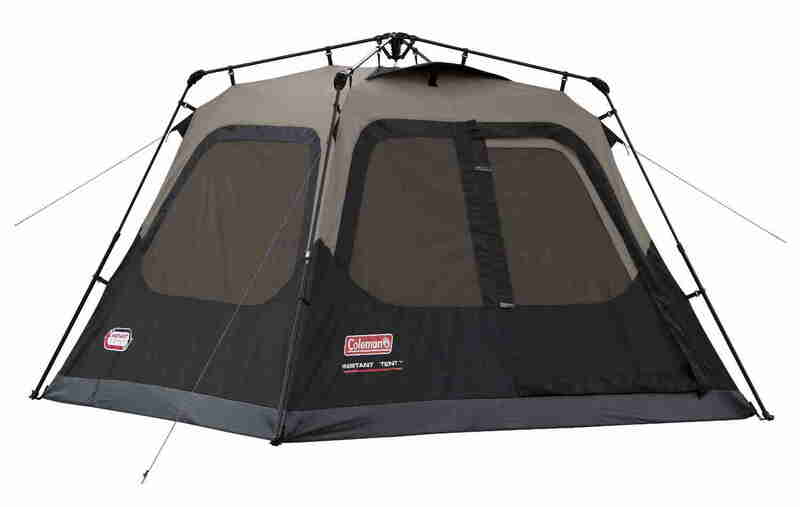 Coleman "Signature" Instant tents are available in the camping section of department and outdoor recreation stores. The ceilings are solid fabric, and the rainfly is optional. The rainfly from the same size original Instant Tent should fit these tents. The Instant Tents in this line have green trim around the door and windows, so campers can think of these tents as the "Green Trim" Instant Tents. This line is available in the same 4 sizes as the original Instant Tent. The zippers on the storm flaps in the front screen room of the Signature Instant Tents 8 & 10 zip completely up the sides and across the top of the window screens. This will seal the screen room from drafts on cool evenings. 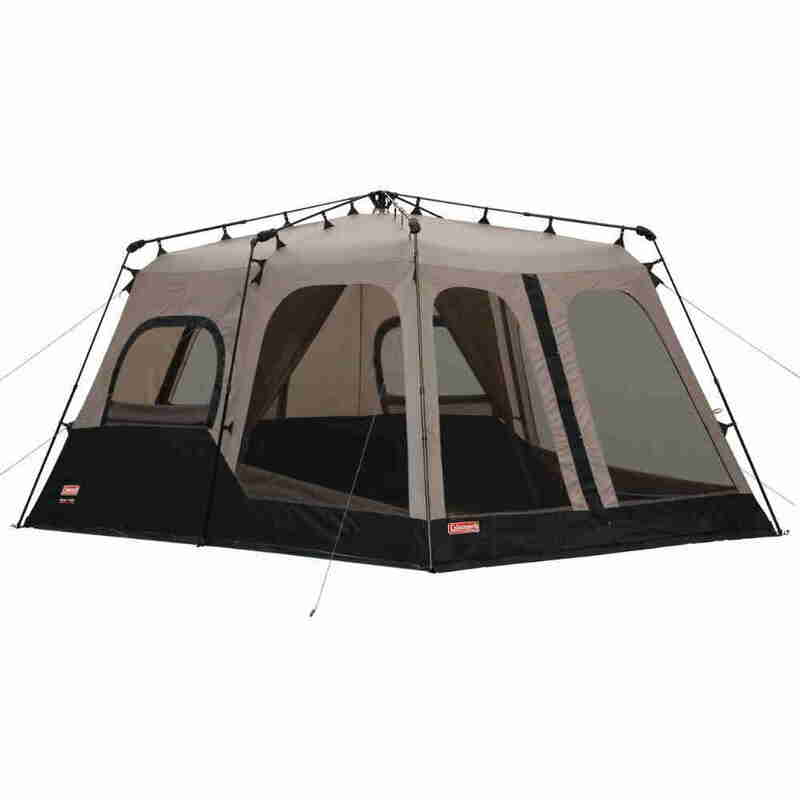 The Signature Instant Tent 10 has a back window, instead of a back door. The Coleman Signature Instant 10 Tent weighs 40 lb. Unlike the other Instant Tent lines, the tents in this line have mesh ceilings and come standard with a rainfly. These tents are marked "Signature Instant Tent" on the tent and "Coleman Signature Instant Tent With Rainfly" on the box. They are available in the same 4 sizes as the original Instant Tent. Campers looking for an Instant Tent with lots of ventilation can check around for these. The Coleman Signature Instant 10 Tent With Rainfly weighs 45 lb. The Signature tent lines have also been updated for 2014, and campers can explore these new tents on the Coleman Instant Cabin page. For 2014 Coleman has introduced several Instant Cabin lines, which are available in the same 4 sizes as the original Instant Tents 4, 6, 8 & 10. However, there are several important differences, including a different pole frame and rainfly, different fabric and a different door. These new tents are marked "Instant Cabin" on the label, while the various lines of original Instant Tents are marked "Instant Tent". Campers can explore these new tents on the Coleman Instant Cabin page. How does the Instant Tent perform in warm and cool weather? Large windows in the walls and doors open to ventilate the tent in warm weather. Peak vents in the ceiling help eliminate humidity from the tent body. Due to the optional rainfly, the ceiling of the tent needs to keep out rain and therefore cannot have mesh panels to exhaust warm air and humidity from the tent. Campers will need to adjust the window storm flaps to manage ventilation, humidity, condensation, rain, temperature and privacy. Without the rainfly, the tent will be more comfortable, if pitched in the shade of, but preferably not under, a tree. This will help keep sunlight off of the tent ceiling and keep it cooler during the day. If a lot of campers are sleeping inside the tent on a warm night and the windows are closed, the Instant Tent will likely become stuffy, due to the lack of ceiling mesh. On cool nights, the Coleman Instant Tent, with its solid fabric ceiling, seals up almost completely to prevent loss of heat. 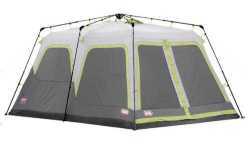 The roll-up storm flaps on the screen-room windows of the larger Instant Tent sizes zip along the sides, but fasten with loops and toggles across the top. Some outside air may seep in through the tops of these windows. The back bedroom windows zip up the sides and across the top and thus seal completely. How does the Instant Tent perform in wind? Due to the hinged and telescoping pole frame, the Coleman Instant Tent is not suited to more than moderately light winds. For the larger, 6-pole sizes, orient the tent, so that a shorter wall is facing into the wind. If the winds pick up or "freshen", campers should consider running 2 guy lines to each pole. Guy-out fabric triangles around the eave of the tent body under each corner joint provide attachment points to secure the tent. The locking mechanism on the telescoping poles, where a button pops into a hole, is not as strong as the rigid fitted joints on a standard cabin tent. The pole frame may be difficult to repair, so campers should try to protect it from winds. Campers who plan to use the tent in moderate to strong winds should look for a site that is sheltered from wind. The optional rainfly offers a second set of guy out points to replace the ones on the tent eaves that it covers. How does the Instant Tent perform in rain? The heavy duty, 150 denier, Oxford fabric has a light rain-resistant coating rated to 450 mm HH. The fabric should perform in short rain showers and light steady rain, which are typical of weather conditions for much family camping. More rain could result in damp walls, so campers are advised to keep bedding away from the walls in rainy weather. Any water drops from the ceiling of the tent will most likely be from condensation, not from rain forcing its way through the ceiling fabric. Wind gusts may also cause a bit of rain to blow through the screens of open ceiling vents and into the tent. Campers who want to be certain that no heavy rains can penetrate the tent ceiling fabric or vents can order the optional rainfly. Because the original Instant Tent has a solid fabric ceiling and seals up tightly, condensation can easily form on the inside of ceiling and upper wall in cool, humid weather, usually at night. Raindrops hitting the tent roof can knock condensation droplets off of the ceiling and onto campers below. Opening the tops of windows and periodically wiping the inside ceiling fabric with a towel will improve this situation. If several campers are occupying the tent without the rainfly, the tent may become uncomfortable in longer than brief rain showers. With the door and windows closed, the peak vents may not be able to exhaust humidity fast enough. If the door needs to be opened in the rain, water will run down the top of the doorway and onto the tent floor. Same with windows. This may become a problem in more than light rain. The optional rainfly will shed rain away from the tops of the windows. Campers can orient the tent, so that the door faces away from wind to reduce the amount of rain in the doorway when opened. If using the rainfly, clipping a plastic sheet around the doorway should keep rain out of the tent when opening the door. Because the original Instant Tent has no ceiling mesh, campers can put up the tent in the rain with little water getting inside the tent body. A bathtub floor keeps standing water from leaking into the tent through ground seams. Campers can get better performance from an Instant Tent without getting the rainfly. In moderate to heavy vertical rain, campers can lay a light tarp over the exposed tent frame. The tarp should hang partway down the walls and be loosely guyed at the grommets to keep it from shifting. This should allow campers to lift the tarp to use the doorway with minimal rain getting inside the tent body. Windows can be mostly opened. Campers should check that rainwater does not pool on the tarp. The Instant Tent should be guyed out whenever a tarp is laid over it. More than light winds may catch the tarp with unpredictable results. How will the Instant Tent perform in various U.S. regional climates? The Instant Tent should perform well enough in the Eastern US with its forested campsites to protect the pole frame from most wind damage. The light waterproof coating on the tent fabric may not resist the heavier rainfall in this region as well as the heavier coatings on other tents will. In the cooler and humid northeastern region, the lack of ceiling mesh will make the tent easier to keep warm on cool nights. A Max Instant Tent, with its ground vents, may be more comfortable in this region. In the warmer and humid southeastern region, campers may need to keep windows open through the day and night. A Signature Instant Tent With Rainfly, with its open ceiling mesh, will likely be the most comfortable Instant Tent in this region. In the more arid, open and mountainous West, an Instant Tent can easily be exposed to more wind than it was designed for. Campers will need to take extra care to protect the tent from wind. However, the tent is well suited to the lighter rains in this region and the optional rainfly should be unnecessary. In the northwestern rainforest region of the U.S., the Instant Tent will be exposed to more and longer rainy periods. The optional rainfly should make the tent substantially more comfortable in these conditions. How does the Instant Tent Pole Frame work? Coleman Instant tents use 22mm (7/8"), 20mm (3/4") and 16mm (5/8") steel poles, depending on the model. Smaller diameter pole sections telescope into larger diameter sections. The pole frame of the Instant Tent features a plastic center hub, plastic hinged corner joints, plastic endcaps and plastic cupped feet to permanently connect the pole sections into a frame to support the tent body fabric. To set up the tent, the tent pole sections do not assemble, but instead unfold and telescope. With the convenience comes a tradeoff in strength. Although plastics are not normally as strong as metals, a durable plastic and good design can create a suitable part for pole frames for inexpensive tents, as long as campers use more care in handling the poles. The pole sections need to stay somewhat aligned when the tent is set up, in order not to overstress the joints. Rough set up or winds can flex or twist the joints to the point of breaking. Campers should be mindful of the plastic parts on the pole frame. These parts will not be as strong as the rigid metal pole joints on a cabin tent or as flexible as the poles on a dome tent. Families evidently get longer life out of the Instant Tent than organizations (group campers) do. This also indicates that campers should protect the tent from rough handling. Heavier fabric means a heavier tent for the size. It also means the fabric is less likely to tear. The heavier fabric may take longer to dry, if it gets saturated in rain. Because the tent body and floor stay attached to the frame, the bottom of the floor will likely be more tedious to clean. Campers should use a ground cloth under the floor to minimize the amount of dirt that collects there. Judging from the popularity of the Instant Tent, owners as a whole are satisfied with the performance and life expectancy of the tent. However, there are a significant number of individual complaints about broken parts and about difficulty in getting a replacement, especially outside of warranty. Ease of set up often involves a tradeoff with ease of repair. Since the pole sections and joints are custom to the tent, standard pole repair kits will be less useful. A splint pole and some duct tape will temporarily repair a bent or broken pole. However, a break in the pole frame of the Instant Tent will likely be at a corner joint or at the center hub, rather than within a pole section. These breaks will be difficult to repair without custom parts. An emergency temporary repair of a corner joint might entail bending a metal rod to the same angle and duct taping it to the pole sections on each side. Campers will need to think outside the box, in order to avoid having to pack up and go home. After first inspecting the tent, campers can consider ordering a spare corner joint and possibly a center hub from Coleman's website, in order to have one on hand at the campsite for repair. These parts are not expensive. Some Instant tent parts are listed on Ebay. A fabric repair kit or tent repair tape will also be handy. Although the tent is an Instant Tent, campers are advised not to rush, when putting it up. Poles can jam and plastic parts can break, if the tent is handled roughly. Wind gusts on the tent fabric can also damage the pole joints during set up, when they are most vulnerable. When setting the tent up in wind, campers can stake the floor corners of the upwind wall of the tent before telescoping the poles. Two campers working together to put up the tent should help reduce the stress on the poles and joints. Hold the tent bundle vertically so that the floor fabric is on the ground and the center hub is up. Campers should now check the top of the center hub for any guidance on setting up the tent. A diagram may show the direction of the door, so that campers can orient it in the desired direction before setting up the tent. Fold down the lower pole sections, so that they lie on the ground. The center hub and upper pole sections should be kept vertical. Carefully continue to unfold the poles at the corner joints, lifting the ceiling fabric of the tent, spreading out the base fabric and telescoping the side poles. The tent body fabric is attached to and opens up with the poles. This will lock the corner joints into place and tension the tent body. The small fabric "sock" cover near each corner joint can now be slid over the corner joints to protect them from dirt and rain. For the 6-pole, Instant Tent sizes, campers will need also to telescope the corner ceiling poles as they unfold the poles. Then lock the side ceiling poles, which do not telescope. This will lock the corner joints and tension the ceiling of the tent. The tent will now be in a kneeling position, with the ceiling fully formed, but at half height. The tent ceiling and body can now be raised from a kneeling to a standing position by telescoping the vertical side poles. The tent body should now be fully formed and ready to position, stake down and guy out. Before telescoping the side poles, campers can first lay the optional rainfly, if available, over the tent ceiling. This will be easier than getting the rainfly over the tent when it is already up. When freestanding, but not staked down, the tent frame is more fragile, and the tent should be immediately positioned, staked down and guyed out to secure it against any winds. Campers should try not to reposition the tent in more than light winds. One mistake many campers make with the 6-pole Instant Tent sizes is to telescope the wall poles before telescoping the corner ceiling poles. If the ceiling hasn't been tensioned before the tent is raised, the tent frame will flop around. The ceiling poles are then quite difficult to reach and telescope, because they are high off of the ground. Campers with the larger Instant Tent sizes with the inverted 'T' style door should tension the tent so that the door does not sag into the tent body. This will help rain shed off of the door and onto the ground, without leaking through any zipper tracks. If there is no staking loop at the center of the doorway, a small, heavy object on the tent floor there should help keep the wall fabric more taut. Sweep the inside floor of the tent and wipe up any spills or mud. Allow the floor to dry. Clean any dirt from the outside edge of the tent floor, where it isn't protected by a ground cloth. Wipe down the side poles with a cloth to keep dust & dirt out of the telescoping mechanisms when they are collapsed. The original Instant Tents do not have ceiling mesh, so campers should open the window zippers a bit to enable air to escape the tent body as it collapses. Unlock and collapse the vertical side poles to lower the tent. Slide the fabric "sock" cover on the corner joints out of the way. With the tent body no longer tensioned, the poles on the 4-pole Instant Tent sizes will probably automatically fold (or flop) in at the corner joint. The ceiling on the 6-pole Instant Tents will still be tensioned. Wipe the corner ceiling poles and then unlock and collapse them. Then fold in the side ceiling poles at the corner joint. If necessary, fold or invert the tent fabric and clean the bottom of the floor. Campers who have not used a ground cloth or who have camped on flooded ground will likely need to do this. Holding the center hub and ceiling pole sections vertically, fold the lower pole sections up towards it. The tent bundle should now be vertical. Wrap some of the fabric around the bundle. Lay the tent bundle on its side, preferably on a clean ground cloth, arrange the fabric evenly across the length of the bundle and roll it up. Work most of the trapped air out of the bundle. Tuck the tent bundle into its carry bag. A tear-off strip on the bottom of the carry bag allows the bag to expand, so that the tent can more easily be packed into it. Spreading out the fabric while putting up the pole frame also helps relieve tension on the joints. Once the tent body is fully tensioned or collapsed, the joints are less vulnerable to breakage. A stuck pole that cannot telescope will likely mean a tent that cannot be put up. A jammed pole that cannot collapse will make it difficult to pack the tent for transport. The Instant Tent will no longer be an instant tent, if campers have difficulty expanding or collapsing the poles. Wiping dirt from the pole sections before taking down the tent and occasionally wiping silicone spray on the telescoping inner pole sections should improve performance. Avoid using oil for this, as it will attract dirt, make a mess and eventually clog up the mechanism. Silicone spray will dry on the surface of the pole sections and keep them working smoothly. If the poles do not telescope smoothly or if they do not lock when fully extended, the sections may have twisted out of alignment with each other. Carefully twist the sections in opposite directions one way or the other until they lock or slide smoothly again. Once the pole sections are aligned, campers can collapse them and then make an indelible alignment mark on both sections. If the sections later twist out of alignment, it should be easy to realign them by matching the marks. Unlike the 150 denier fabric of the Instant Tent, the carry sack fabric is fairly light gauge for the weight of the tent. Campers will need to take care not to tear the bag when loading or carrying the tent. Because of the collapsing and folding pole frame, the Instant Tents poles collapse into fairly long lengths and use a longer carry bag than many cabin tents of similar size. The packed length of these tents varies between 3' to 4'. Campers may need to employ some ingenuity when loading the tent into a small cargo space. If campers need to pack up the tent wet at the campsite, they can quickly set it up to dry upon arriving home.